The Japanese Tea Ceremony is a detailed examination of the five-centuries-old tea ceremonyorCha-no-Yu in Japanese, literally "hot water for tea"a cornerstone of Japanese culture and a core practice of Zen Buddhism. Framed by intricately choreographed steps, the tea ceremony is as much about the search for enlightenment as it is about serving tea. Within the serenity of the tea room, the ceremony, with its highly formal structure, becomes an object of focus for meditation. As the water is heated and the tea is served, the ultimate goal is losing the sense of self while gaining inner peace. 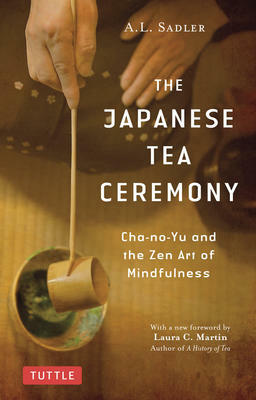 The path to mindfulness runs through the center of the tea ceremony. Abundantly illustrated with over 160 drawings and 40 color photos showing every aspect of the ceremony, this book takes readers on a complete tour of furniture and utensils, teahouses and gardens, and numerous other features ofCha-no-Yu. It also delves into the many disciplines included within the broader framework of the tea ceremonyJapanese art, calligraphy, flower arrangements, architecture, gardening, and exquisite handicrafts. Learn more about the experiences of masters of the tea ceremony over the centuries and histories of the various schools and traditions of the art of tea. Full-color photos of tea bowls, teahouses, and gardens reveal the exquisite artistry of the cult of tea and this important Japanese tradition. With a new foreword by award-winning author Laura C. Martin,The Japanese Tea Ceremony is a fascinating exploration of the ritual and Zen philosophy of one of Japan's greatest customs, truly "an epitome of Japanese civilization."